The British Gazette » No Contest: A forgone conclusion: Defeat. Total defeat. Top left, Dr. Vladimir Vladimirovič Kličko PhD (Sports Science). Top right, Peter H. Rogers, Editor, British Gazette. Bottom left, Herman Van Rompuy, President of the European Council. Bottom Right, David Cameron, Prime Minister. Readers may well ask: What is the connection between these four men? The answer lies in the title of this article: No Contest. Were a boxing match to take place between Doctor Kličko and the Editor of this organ, the result would be a forgone conclusion. British Gazette readers could have no possible doubt whatsoever over the outcome. It would be a knockout (of yours truly) in the first second of the first round with the first punch Doctor Kličko throws! Of that there can be no possible doubt whatsoever. The only solace yours truly would have would be that “the fight” – if such an ill matched contest could ever be described as such – would be over very quickly for the writer and that the good doctor would be able to use his great knowledge of pugilism and the human frame to ensure that he used just a sufficient amount of his great strength to put us on the canvas without (hopefully) causing any lasting damage! 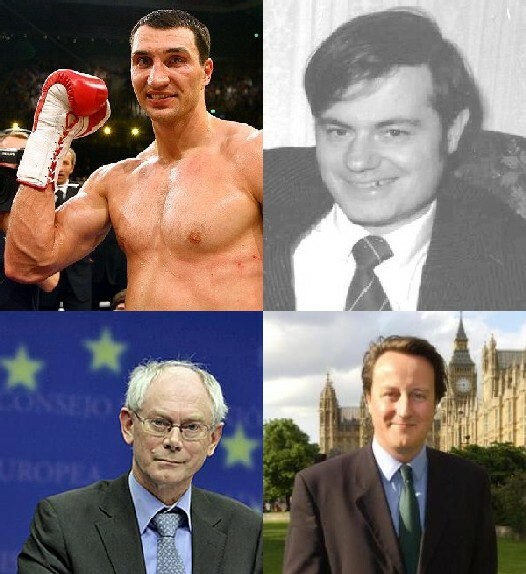 As to the other two worthies of this foursome, the forthcoming contest between President Van Rompuy and Prime Minister Cameron, is we are afraid, just a sure-fire conclusion. A British defeat. In our article yesterday we noted that it was unlikely that George Osborne would have sufficient rigour to demand significant concessions to ensure that this now suzerain state becomes that little bit less suzerain. Following the latest reports, the British Gazette regrets to announce that it is now a foregone conclusion that Cameron will end up with little more than illusory concessions. They will prove to be illusory for any concession the EU will appear to have given will be “clawed back” subsequently by the inventive and creative use of one or more of the many clauses of the many treaties by a court – made up of like minded political appointees – that is wholly dedicated to bringing about a European federal structure across ALL its members. Mr Cameron is suggesting that he will demand concessions specifically so far as the EU abandoning plans to tax the City of London and to set aside SOME health and safety regulations. The British Gazette has no doubt that the EU will after much wrangling appear to have made concessions and Cameron will doubtless return holding in his hand: “……..a piece of paper with Herman Van Rompuy’s signature on it……..” in much the same way as another Prime Minister returned with another piece of paper with another European leader’s signature upon it back in 1938. British Gazette readers again can be in no doubt whatsoever that both pieces of paper and both signatures are equally worthless. All the breast beating and hand wringing in the world will not achieve one iota of change in our relationship with the EU. All that matters by way of protest is civil unrest manifested by ‘boots on the street’. It is both well understood and noted by Brussels that the EU is despised and disliked in this country. Little opportunity is lost by a majority of the British press to denigrate the incompetancies and wastefulness of Brussels. None of this makes any difference to the attitude of the EU whatsoever. This profoundly anti democratic institution continues on its remorseless juggernaut progress towards federalism.. It won’t happen but, we need to take to the streets in our tens of thousands. Then, and only then with serious civil unrest a daily feature on our streets will M. Rumpy Pumpy and his governing elite sit up and take notice. Today, I was paid to entertain the children of hundreds of Derby people, marching against the impending closure of, Bombadier. It was a well ordered, good humoured affair, and so all the more impressive. Here were hundreds of honest, hardworking people, taxpayers betrayed by Cameron, a millionaire, who has not the faintest idea of the crushing despair felt by those affected by his export of 12,000 British jobs. No doubt, Angel Merkel, will reciprocate by exporting 12,000 jobs to Britain? Cameron is am EU quisling, a traitor, like the five Prime Ministers, before him.